Fox News recently covered a story on a turkey that ruffled quite a few feathers on a Delta flight, and it wasn’t because passengers caught a glimpse of the flying fowl from their windows. 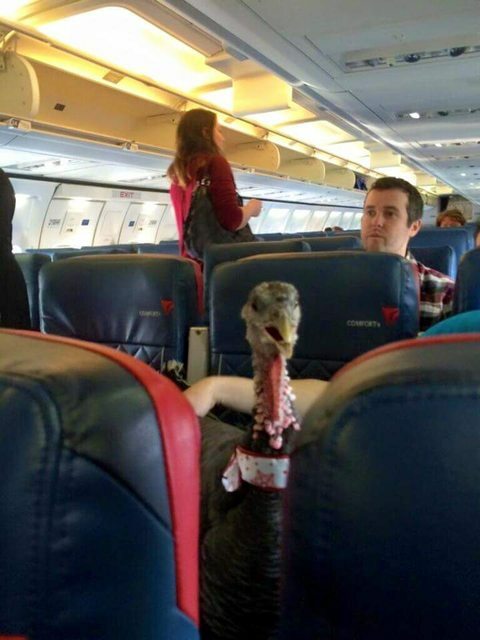 The turkey – which was brought on the flight as a regular passenger with its own assigned seat and all – was allowed on the flight as an emotional support animal. The traveler who owned the bird was able to provide the airline with the proper documentation required, forcing Delta’s hand into printing a boarding pass for the poultry. But when is enough, enough? The honest answer: who knows? Lately, it seems as if the use of emotional support animals is becoming more widespread. Community associations, which are commonly faced with this issue, have been fighting for stricter standards for years. In fact, communities with pet restrictions that have fought passionately against accommodating your regular cat and dog are now having to battle against allowing animals such as pigs and even kangaroos to enter their communities. The real crux of the matter is that as people get more and more creative with their requests, the law seems to stay silent. The important thing to keep in mind is that there are certain steps community associations can take to evaluate the service/emotional support animal request to ensure its legitimacy. Remember, there is certain information an association can and cannot ask for, and wrongfully denying a request for a reasonable accommodation may result in a costly and protracted legal battle. When in doubt, consult with qualified legal counsel to guide you through the evaluation process to make sure that you are not exposing your community to any liability – even if the end result means having a turkey as a neighbor. Click here to read the report in the Fox News website.